Another action-packed Sisters By Choice book…REDEMPTION–releases today. To celebrate the release of REDEMPTION, I’m giving away a $25 Amazon Gift Card. But wait…there’s more! I always feel bad for the people who enter but don’t win. So I’m also going to pick FIVE more lucky names to win a $5 Amazon Gift Card. Just the right amount to buy REDEMPTION! Just kidding, the winners can use it to buy whatever they wish. Leave a comment and you’ll be entered in the contest. ← FRIDAY IS FOR FRIENDS–Laura Hilton! The blurb is so intriguing! Can’t wait to read it! Thanks for sharing Lillian!! Sounds like an awesome book! Looking forward to reading it! Being recently I traced to your books, I am ready for another from a “fellow Ohioan”!! That happens! Don’t worry about it. Where are you from, Kelli? Are you a writer and what type of books do you write? would love to read Redemption! I know I had fun writing it. Hopefully that means my readers will enjoy it as well. 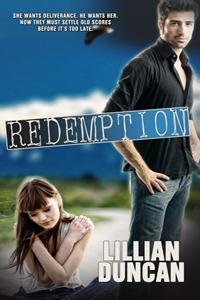 Lillian, I’ve been wanting to read one of your novels for a while now and REDEMPTION sounds like a great read! My books are little more on the suspense side but there’s plenty of romance, too. Awesome! Does each new release make you equally excited, or does each one feel a little different? I get excited every time! it is such a blessing to be doing something I love. I look forward to reading Redemption!! !